Sleepy, Southern And Segregated: What D.C. Was Like In '63 The 1963 March on Washington was a pivotal moment in the civil rights movement. And the city those protesters marched on 50 years ago was very different from the Washington of today. 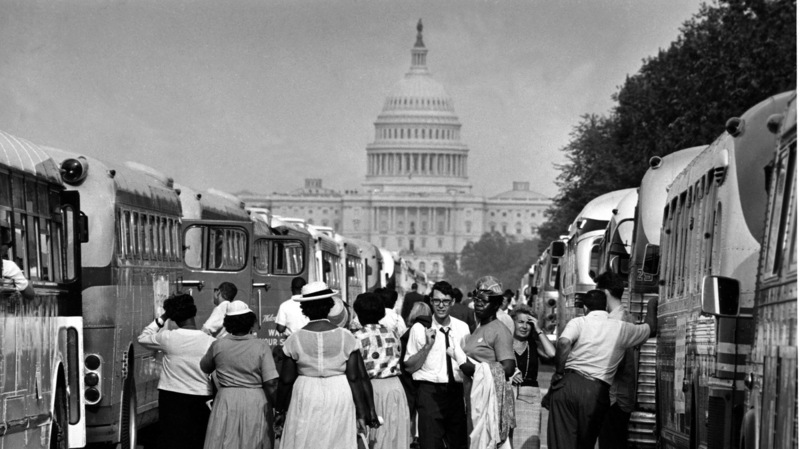 Charter bus passengers look for their transportation home after the March on Washington of Aug. 28, 1963. Fifty years ago this week, when hundreds of thousands of demonstrators came from across the country to take part in the 1963 March on Washington, the city was not yet the cosmopolitan capital that it arguably is today. But it was a mecca for African-Americans, says historian Marya McQuirter. "Washington was definitely a different city 50 years ago," she says, "for a number of reasons. By 1957, it had become the largest majority black city in the country." That was, in part, because of "white flight," she says, but also because D.C. was "an attractive place for African-Americans migrating from the South." As well as from the North. Ella Kelly came to Washington from New York's Harlem, first to study at Howard University, then to live. "It was Southern, and you learned that very quickly," she says. "I don't mean that in a negative way. There were things such as you'd stand at the corner, waiting to take the bus, and little ladies would say, 'Good morning.' That kind of thing." Kelly, a retired public school teacher and government worker, remembers Washington then as a beautiful city. But she remembers ugliness, too, like the time she and her husband looked at an apartment for rent. "The manager of the building was an African-American woman," Kelly says. "There was a sign outside that said, 'Apartment available.' We knocked on the front door. She came to the door, and she said, 'We don't rent to colored.' She was a person of color. My husband and I looked at each other ... 'OK, whatever,' and we left." That kind of segregation was not uncommon in Washington. Paul Kuntzler, who moved to D.C. from the Detroit area shortly after the inauguration of John F. Kennedy, says Washington was "just a very different place then." In his Capitol Hill neighborhood, there were only white residents, he says. "The early jobs I had, they only employed whites. It was ... a pervasive part of the culture. Even the gay bars were all white." The District of Columbia in 1963 was very much under the thumb of Congress. There was no home rule, and it would be four more years before Lyndon Johnson appointed the city's first mayor. In the days leading to the march, federal officials were concerned about the possibility of violence. National Guardsmen were posted along the march route, liquor stores were ordered closed, and many businesses — including the one where Kuntzler worked — were shuttered. "Because of a fear that there might be riots, President Kennedy declared a virtual state of martial law," he recalls. "As it turned out, it was the most quietest day in Washington. There was virtually no crime at all." Kelly was a Red Cross volunteer, stationed in a tent near the Lincoln Memorial. She remembers a steamy August day and worries over whether anyone at all would show up. But they did, some 200,000 strong. "They had all of these signs. People were so well-dressed," she says. "I thought, 'How can these women walk down the street in this heat in high-heeled shoes with the gloves and the beautiful dresses?' "
Kuntzler says the emotional high point of the day for him was swaying along with the crowd, singing "We Shall Overcome." And Kelly, who she says is not given to tears, nonetheless is misty-eyed thinking back 50 years. "All of America in their Sunday best protesting something that they thought was unjust," she recalls, "and this was the American way of doing protest." It was, she says, breathtaking.